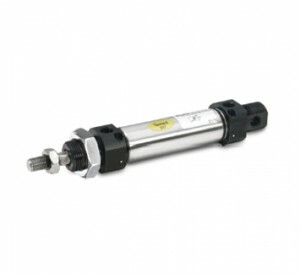 The P1D series is a complete range of ISO 15552 cylinders, easily integrated into a wide range of applications with high technology design for just about every conceivable application, both simple and extremely complex. 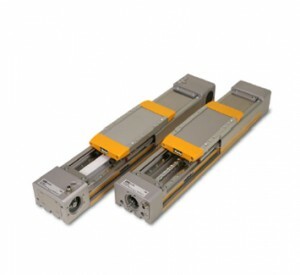 Double-acting with a unique air cushioning design, the light and stiff body extrusion makes the cylinders robust in performance with sensor grooves for simple and protected sensor installation. 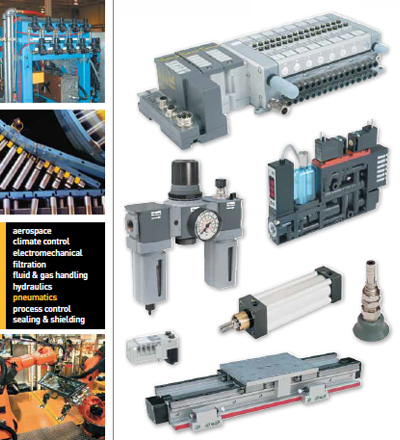 With internal components made of high strength plastics, P1D series delivers quiet operation and long service life. Available in a range of design variants, the P1D series has a solution to suit the requirements of any application. The P1A series is a complete range of ISO 6432 cylinders, easily integrated into a wide range of applications and features a compact design particularly suitable for lighter duties in the packaging, food and textile industries. Hygienically designed, P1A cylinders consist of a smooth stainless steel cylinder tube and piston rod with aluminium anodised end caps. Corrosion-resistant materials are accompanied by initial lubrication with our food-grade grease, ensuring these cylinders are a suitable solution for food industry applications. Available in a variety of bore options to suit the application requirements, the P1A series has a solution to suit the requirements of lighter duties as well as more demanding applications. 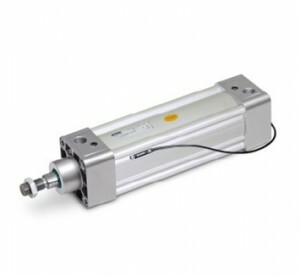 The P1P series is a complete range of ISO 21287 compact cylinders, easy integrated into a wide range of applications with one of the largest ranges of sizes and variations available. 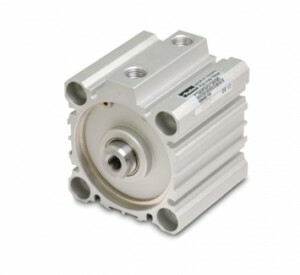 Utilising high quality anodised aluminium with a stainless steel piston rod and proven seal technology, the P1P series delivers the high possible performance quality and long service life. 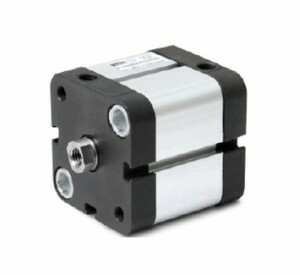 The very compact axial dimensions make it possible to utilise the P1P cylinders in a variety of applications. 50% shorter than the ISO 15552 cylinders but with the same stroke length, the P1P solutions are the ideal option for narrow spaces in machines or production lines making it a truly versatile cylinder family. The P1Q series is a complete range of ISO 15524 cylinders, easily integrated into a wide range of applications with the modular flexibility that machine builders need today. Quiet in operation due to its built-in buffer cushioning as standard, the P1Q series is available in 10 bore sizes from 12 to 100mm and standard stroke from 5 to 100mm, the cylinder is supplied in a choice of magnetic or non-magnetic function with the non-magnetic version offering very short axial dimensions. For optimum compactness, the P1Q range is supplied with female piston rod thread. Included within the magnetic versions, bores 32-100mm, is a Teflon piston wear ring providing superior service life. In addition to the compact build and modular design flexibility of P1Q, are a range of cylinder mountings include flange, foot and clevis brackets for ease of installation. 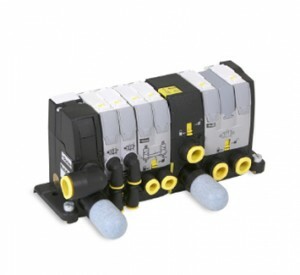 Readily multi-functional, the Moduflex Valve System is a key component for electro-pneumatic automation and can be employed in a variety of ways; stand-alone valves, fieldbus ready valve islands, cylinder flow controls and vacuum generators with integrated blow-off. 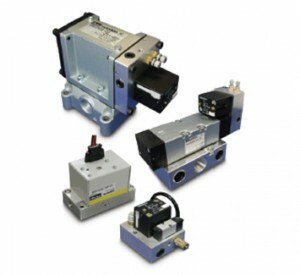 Available as discrete components or as a pre-assembled and tested valve island, Moduflex Valve System can be simply adapted once specified. With three sizes available, Moduflex is capable of operating at three different flow ranges (275, 510 or 1340 Ni/mn), which can all be combined on to just one valve bank. Each valve on the bank can be precisely adapted to the actuator size enabling the system to be utilised in any application offering ultimate flexibility. The Viking Lite valve range offers a robust and versatile solution delivering high performance and efficiency on a wide range of industrial applications at a reasonable cost. Available in three post sizes (G1/8, G1/4 and G3/8), the compact design, direct body porting and integral mounting holes amount to a highly flexible solution. Manufactured from anodized aluminium, Viking Lite offers a valve with excellent corrosion resistance and, with a smooth to eliminate dirtcollecting pockets, suitability for a wide variety of environments. Through its Wear Compensation System, Viking Lite valves deliver robust performance for a longer service life with short change over times and low change over pressure for reduced service time. Fitted with Parker’s dynamic bi-directional spool seals, the range can operate comfortable at pressure up to 10 bar and in ambient temperatures from -10°C to +50°C and deliver up to 10 million operating cycles. The Viking Xtreme Valve range is a robust and versatile solution that combines high performance in extreme environments with compact installation dimensions. Following aggressive environment and vibration testing, Viking Xtreme valves have been designed to have a robust body made of anodised aluminium and will operate in ambient temperatures of -40°C to +60°C with good corrosion resistance. Compact dimensions, direct body porting and integral mounting holes are all features of the Viking Xtreme range. In addition to single valve installation, the Viking valve may be installed on manifolds that the valves all have a common supply and manifold exhausts. 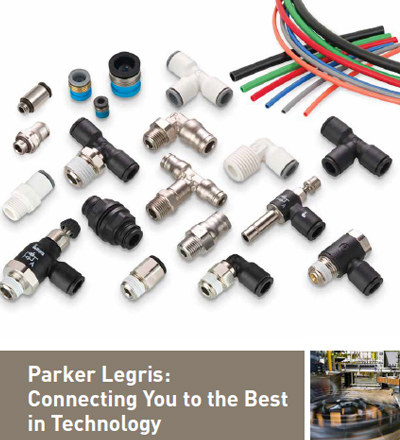 Available as stand-alone or stackable solutions, PVL-B2 valve series is a key component in controlling isolated cylinders with a compact design ideal for constricting cabinet environments. 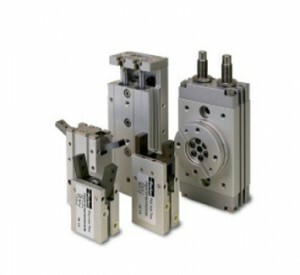 The stand-alone series are compact and easily mounted on machines close to the actuator with a neat electrical pilot. 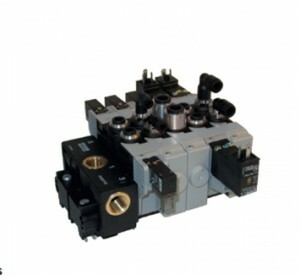 For ultimate flexibility, they can also be stacked and mixed into a stacking valve island. The stacking series permits assembly of several valves in one stack supplied by either a single or a dual head/tail set with each stack capable of handling any combination of single or double solenoid valves. 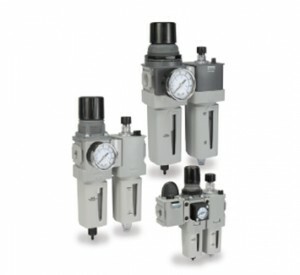 With a variety of air preparation solutions in the range, the Global Air Preparation System features particulate and coalescing filters, regulators, filter / regulators and lubricators to ensure fact cycle times, high product quality and minimised downtime. Available in three body sizes, this comprehensive system can easily be assembled into various combinations, utilising patented modular lightweight body connectors to ensure there’s a solution for every kind of air preparation problem. The P33T – CAT 4 redundant safety exhaust valves, used in conjunction with a safety relay or safety PLC for pneumatic circuits, offers Category 4 Performance Level e (PLe) in accordance with the latest Machine Directive EN ISO 13849-1. Based on proven, control-reliable technology, the IP65 rated P33T 3/2 normally closed valve offers integrated soft start functionality. As a result, air can be introduced in a controlled manner to the system when energised, thus allowing users to adjust for slower or faster build-up of system pressure. Importantly, the valve allows the rapid exhaust of downstream air when de-energised to remove stored energy and allow safe access. 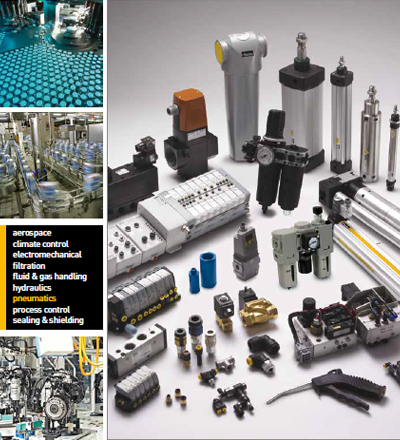 Designed to suit the demands of industrial automation applications, the extensive range of pneumatic technologies including pneumatic grippers, rotary actuators and slide table products. Optimised to deliver a competitive, high quality and reliable solution to produce and work piece handling, this unique range delivers performance coupled with precision and repeatability, all from a single source supply. These solutions can be deployed in a variety of applications across sectors such as machine tools, automotive, aerospace, electronics, medical and packaging. The innovative Air Saver Unit can reduce air consumption by up to 50% and improve efficiency in air blow applications. Using pulsed air technology, Air Saver uses a switching valve at its core that converts continuous air blow into pulsed air blow without the need for any additional external control. Aside from a sizeable reduction in air consumption, the Air Saver Unit offers other major advantages including savings in compressor power, reduction in overall CO2 emissions and a significant contribution to energy-activities. There are seven models available in the Air Saver Unit range, offering flows at 5 bar from 150 to 15,000 l/min. 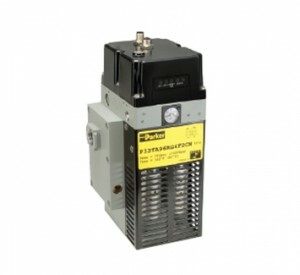 Extremely easy to install, at plants using electrically operated solenoid valves to control air blowing, the units can be quickly and easily retrofitted. • Up to 50% saving on operating costs as the pulsed air blow generates reduced air consumption significantly in comparison to conventional continuous blow solutions. Designed to offer absolute reliability and high performance, the easy to use solution satisfies even the most demanding of applications. 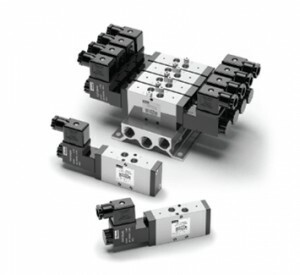 A completely modular concept, OSP-P enables pneumatic and electric drives to be combined with guides and control modules for all kinds of applications. The main system carriers are the drives themselves, consisting of extruded aluminium profiles with double dovetail slots on three sides, providing direct mounting for all modular options. Developed for absolute reliability, high performance, easy handling and optimised design, the OSP-E can master even the most difficult installation requirements with seven actuator options for all possible applications. 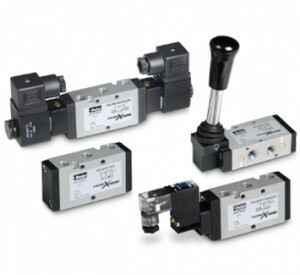 OSP-E is a completely modular concept enabling pneumatic and electric actuators to be combined with guides and control modules for all kinds of applications. 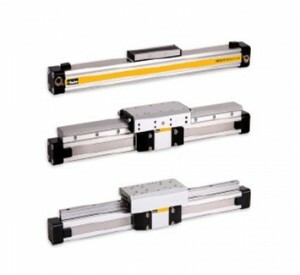 The main system carriers are the actuators themselves, consisting of extruded aluminium profiles with double dovetail slots on three sides, providing direct mounting for all modular options.